Only 8 copies left of “Zenith,” our first regional history book! Back in 2004 I was introduced to Duluthian Jerry Paulson and his spectacular collection of lithographic postcards of Duluth and the surrounding area, which inspired me to publish two small novelty books Greetings from Duluth, each featuring 20 reproduction postcards. I soon discovered people wanted more than just the 25-word description that accompanied each card—they wanted a more complete history of each card’s subject. So with the help of the late Maryanne Norton, I started researching and writing. I also added to Jerry’s selections more vintage postcards from the collections of Herb Dillon, Bob Swanson, and Tom Kasper. 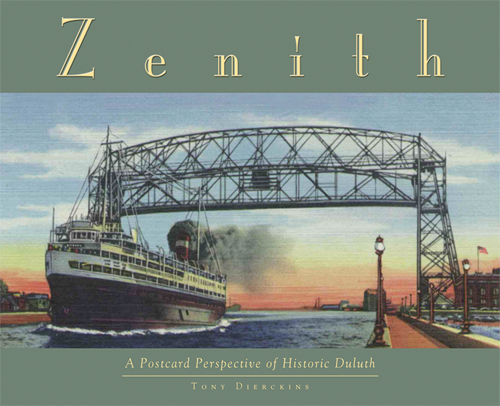 The result was 2006’s Zenith: A Postcard Perspective of Historic Duluth, which includes over 500 vintage lithographic postcards of Duluth, Superior, the Iron Range, and the North and South Shore of Lake Superior. We printed 5,000 copies of the book, and its popularity inspired our focus on regional history. A dozen years and years nearly a dozen regional history books later, there are just eight copies of Zenith left in stock. Regularly $20, it is priced at just $13.25—that’s 33% off—for the rest of 20018, and you can buy it here. 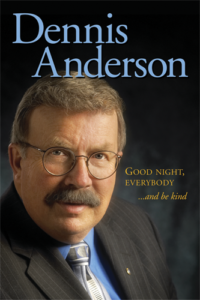 Speaking of limited inventory, we are also down to just a dozen copies of Goodnight, Everybody…and be Kind, Denny Anderson’s fun and fascinating memoir. Denny’s book, regularly $15; is on sale for $7.50—that’s 50% off!—for the rest of 2018. You can or it here. 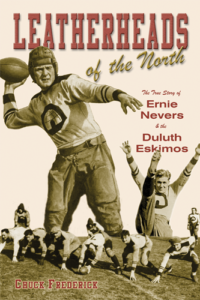 And for just $2.50 more, you can pair Denny’s book with Chuck Frederick’s Leatherheads of the North: The True Story of Ernie Nevers and the Duluth Eskimos. regularly $15, this is a must read for any Minnesota football fan in your life—and it may be your last chance to get the book, as we have 50 copies left in stock and it too is on sale for 50% off for the rest of the year. Buy Leatherheads, or both books together, here or here. Well, that didn’t take long! We’re all sold out. Thanks, everyone!